If festivals in October set the mood for the festive season in India, November takes the festivities even further. At the beginning of the month (November 3) is the most popular and grandest of all – Diwali or Deepawali. 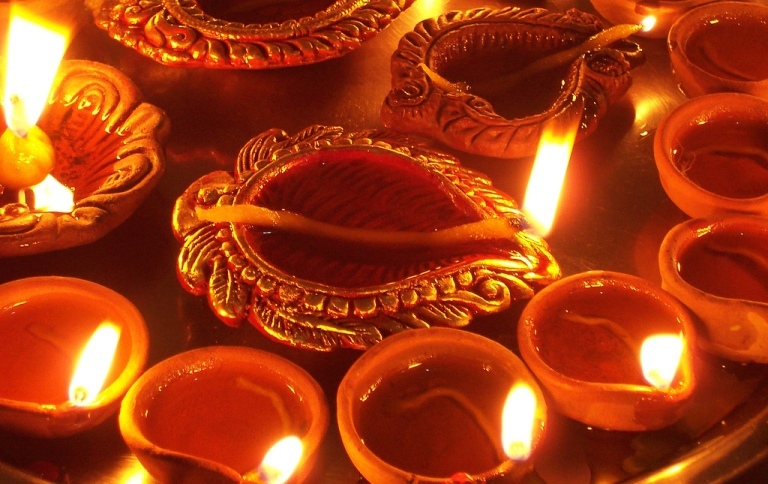 Predominantly celebrated with gusto and fervor in North India, Diwali is the festival of lights. Diwali marks the return of lord Ram to his kingdom, Ayodhya, after 14 years of exile. Ram’s coming to Ayodhya is celebrated with lighting of diyas. The victory of light over darkness is the essence of Deepawali. Today, the basic concept of celebrating Diwali has not changed. It is still the festival of lights; however, earthen diyas (lamps) have been replaced by candles and cheap Chinese lights. Diwali is all about bringing in new energy and verve in the lives of people. It is the time to clean and decorate homes. Buy new clothes, household items, and exchange sweets and gifts. It is also that time of the year when one can get huge discounts on electronics items, automobiles, home décor and apparels. Diwali also marks the beginning of a new calendar year for businessmen. Diwali is the best time to visit India for foreign travellers, who want a slice of Diwali festivities. Bazaars are beautifully decked up and there is joy and happiness all around. Soon after Diwali is Chhat Puja (November 3). The festival is traditionally celebrated in Bihar. Chat celebrates the worshipping of the Sun, to thank the god of light and positive energy for sustaining life on earth. Women fast during the Chhat Puja for the welling being and prosperity of their family. Rajasthan, which is the most colourful state of India, celebrates Kolayat Fair (November 9-17), also known as Kapil Muni Fair. The festival is celebrated in Bikaner. It is a mix of trade and pilgrimage. On the one hand buffaloes, horses and goats are traded, and on the other pilgrims take a dip in the lake. Pushkar Camel Fair (November 9-17) is among the most popular and much awaited cattle fair of the year in Rajasthan. The fair witnesses a large number of foreign and local tourists. It is a fair where cattle are traded and people take a dip in the holy waters of the Pushkar Lake. Pushkar Cattle Fair offers a wonderful opportunity for photographers to capture the best photos at Pushkar Fair. Pushkar is a holy town located approx. 20 km from Ajmer. Ganga Mahotsav 2013 (November 14-17) is a festival of music and dance, which is celebrated in the ancient city of Benares or Varanasi as it is officially known today. It is a must visit town if you are spiritually and religiously inclined. The highlight of the festival is the floating of millions of diyas at dusk that marks the culmination of Ganga Mahotsav. Guru Nanak Jayanti or Guru Purab (November 17) commemorates the birthday of Guru Nanak, the founder of Sikh religion. The benevolent saint and first of the ten Sikh gurus was born in Rai Bhoi Ki Talwandi (present day Nankana Sahib), now in Pakistan. The Golden Temple in Amritsar is the place to be during the Guru’s birthday. The holy Sikh shrine and gurudwaras across the country are beautifully decorated and langars (community meals) are served. Sonepur Fair 2013 (November 17) is believed to the Asia’s biggest cattle fair. Held on the banks of the Sonepur river, the fair combines spirituality and trade. Like Pushkar Fair in Rajasthan, Sonepur fairs sees a heavy dose of selling and buying of all sort of animals like elephant, horse, rabbit, dog, donkey and goat. Sonepur is approx. 25 km from Patna, the state capital of Bihar.